Gazing into the sea, you can often see dolphin playing in the ocean or schools of fish in the crest of a breaking wave. How fascinating it is to watch seagulls dive head first into the ocean and come up with a fat fish for dinner. What fisherman wouldn’t love to have the precision in catching fish like the old seagull? I am a collector of shells. The Crystal Coast may not have the abundance of shells found in Sanibel Island, Florida but I have spent many hours bent over the sand from Emerald Isle to Fort Macon, picking through piles of shells. On one trip walking down the shore from Atlantic Beach to Fort Macon, I found a large conch shell lying on the beach. Don’t overlook what may appear as piles of broken shells along the shoreline. Take a chair and begin to look closely through the shells. I have found hundreds of tiny conchs, letter olive shells and eastern augers. Some of the shells are so tiny that several would fit on a dime. You would never see these perfectly formed shells if you were strolling down the beach. You have to stop and look. Atlanta Beach is a great spot to find beach pebbles along the shore. These smooth stones come in all sizes. Their colors vary from pure white to black with various shades of brown and gray in-between. I have taken the stones and placed then along with votive candles in a dish for decoration. 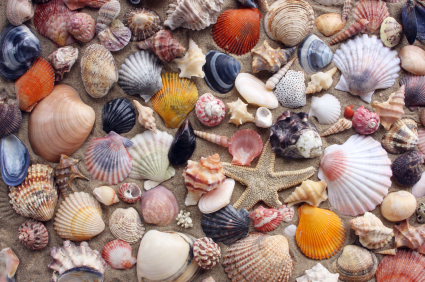 What treasures have you found on the Crystal Coast beach?